Files with asa file extension can also be found as Active Server configuration files. Used with ASP.NET. The asa file extension is also reported to be used for some Active Server document format. Programming ASP websites is made possible by various built-in objects. Each object corresponds to a group of frequently-used functions useful for creating dynamic web pages. In ASP 2.0 there are six such built-in objects: Application, ASPError, Request, Response, Server, and Session. Session, for example, is a cookie-based session object that maintains variables from page to page. Web pages with the ".asp" file extension use ASP, although some Web sites disguise their choice of scripting language for security purposes. 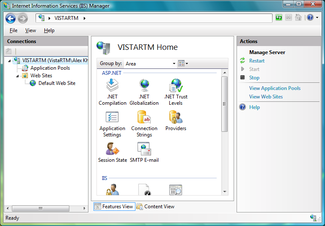 The ".aspx" extension is not an ASP page, but an ASP.NET page, another server-side scripting language from Microsoft, based on a mixture of traditional ASP, and Microsoft's .NET technology. Most ASP pages are written in VBScript. To view the file (webpage) directly on internet via http protocol, use any common browser available. To edit this file and source code, you can use any text editor or web development application intended to Active Server Pages development like eg. Microsoft Visual Studio etc. Click on the tab below to simply browse between the application actions, to quickly get a list of recommended software, which is able to perform the specified software action, such as opening, editing or converting asa files. Programs supporting the exension asa on the main platforms Windows, Mac, Linux or mobile. Click on the link to get more information about listed programs for open asa file action. Programs supporting the exension asa on the main platforms Windows, Mac, Linux or mobile. Click on the link to get more information about listed programs for edit asa file action. Programs supporting the exension asa on the main platforms Windows, Mac, Linux or mobile. Click on the link to get more information about Sublime Text for create asa file action. Click on the software link for more information about Microsoft Internet Information Services. Microsoft Internet Information Services uses asa file type for its internal purposes and/or also by different way than common edit or open file actions (eg. to install/execute/support an application itself, to store application or user data, configure program etc. ).